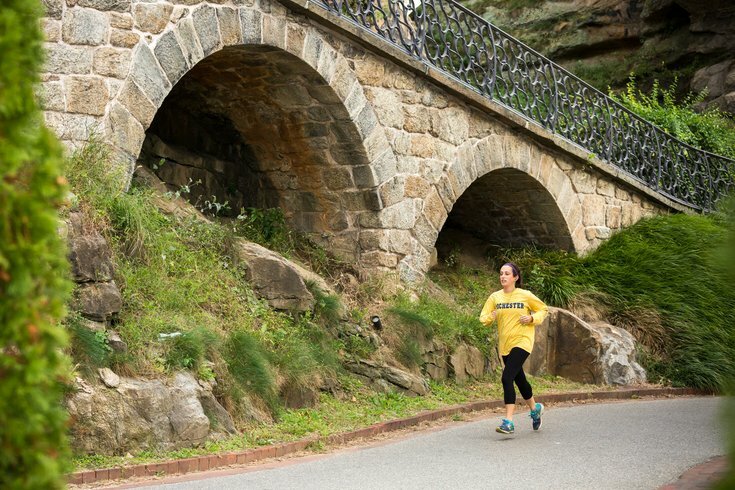 Philadelphia is one of the best cities for both urban and natural trails. We have big news for all the fit females of Pennsylvania who are up for a challenge. The only women-only triathlon in the state has recently opened registration. It's a new event from DelMoSports, a company that primarily hosts races along the Jersey Shore and in Delaware. The Women's Philadelphia Triathlon will take place in Philly's Fairmount Park on Sunday, July 8. No one has to take a dip in the Schuylkill River, though. This triathlon will feature an outdoor pool swim. Along with the triathlon, there are also two other race options. All start at 6:30 a.m.
• Sprint Triathlon - Consists of a 400-meter swim in the Kelly Pool, a nine-mile bike ride on Martin Luther King Jr. Drive (closed to traffic) and 5K run through Fairmount Park. • Sprint Aquabike - No running involved in this one. Participants do the 400-meter swim and 9-mile bike ride only. • Sprint Duathlon - OK, so you actually love to run. This option includes a two-mile run past the Please Touch Museum, followed by the nine-mile bike ride and 5K run. Individual registration starts at $89. Relay registration starts at $139. All participants will receive "big bling," swag, complimentary photos and post-race food.